The FastCorp Ice Cream Vending Machine is a robotic machine that the customers love to watch. The robotic suction arm picks up the item and drops it in the delivery bin. FastCorp ice cream vending machine is the best and the only solution to all your sugar cravings. While at work, the FastCorp ice cream vending machine is a beauty to watch! 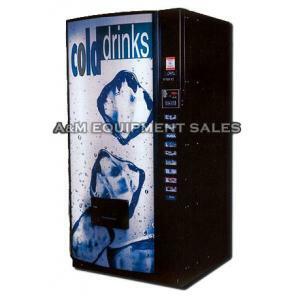 FastCorp ice cream vending machine is the only ice cream vending machine that comes with an arm that automatically picks up and vends ice creams for you. FastCorp ice cream vending machine provides your customers with an ice cream parlor show that runs 24 hours a day and 7 days a week! This is the major reason why this ice cream vending machine is a must to have entertainer in your parties and family functions. FastCorp ice cream vending machine vends an entire variety of premium branded ice cream and frozen desserts. FastCorp ice cream vending machine comes with a strong anti-vandal guard system, allowing you to comfortably fit your vending machine in the middle of the beach and let everyone enjoy the Icy view. Provide your customers with an ice cream parlor show with the Fastcorp Ice Cream Vending Machine 24 hours a day, 7 days a week! Vends a full variety of premium branded ice cream and frozen desserts. Will vend 12 different selections of ice cream or frozen foods. 2 Year Limited Warranty on Parts. Shipping not included. 5 Year Manufacturers Warranty on Freezer. Shipping not included. (72″h x 39.4″w x 39.5″d). Shipping weight approx 735 lbs. Electric 115V 60Hz 10 amps. Telephone technical support available Monday – Friday 8:00am-5:00pm EST. Add $200 if you want ice cream sign and side panels.